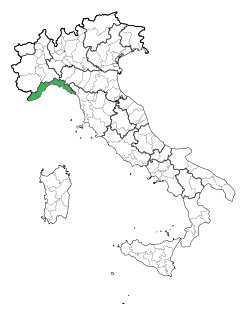 Liguria is a crescent shaped strip of land bounded by France, the Alps, the Appenines and the Mediterranean sea. The coastal strip is known as the Italian Riviera. Liguria is one of Italy's smallest regions, and the topography is quite rugged as the Alps and the Apennine Mountains come down to the sea. Vineyards are thus small and scattered, and they must compete for the limited available land with the region's flourishing flower growing indusrty, olive groves and vegetable gardens. The capital Genoa has long been an important trading port and hence it has been influenced by contact with Spain, France and other parts of Italy. Genoa has been a player in the rise and fall of empires and the rich history of the Mediterranean over three milennia. The city has developed into a cultural melting pot. This heritage has a reflection in the wine varieties used in Liguria, over 100 were counted in a census a few decades ago. There are no outstanding wines in this region, unlike the neighbouring Lombardy which boasts it's world class Barolo and Barbaresco. Much of the production of Ligurian wine is used by the locals or to slake the thirst of the plentiful tourists, however some wines do show regional character and are well worth trying. The maritime influence as well as the local vegetables feature strongly in Ligurian foods. Pesto - a lovely basil based green sauce, goes with anything. Torta Pascalina - 'Easter cake' is really a pie with cheese, eggs, herbs and Spinach or Swiss chard filling. Torta Marinara - not a fish pie, but a savory flan filled with spinach, cheese and mushrooms cooked by the fishermens wives as a change from eating fish at sea. Famous resort towns along the coast include San Remo, Imperia, Portofino, Rapallo and Santa Margharita. This region is more often visited for its scenery (Cinque Terre Villages, Italian Riviera) than for its wine. Liguria is one of Europe's favourite playgrounds with a huge range of activities include hiking, whale watching, diving, and all the trappings of beach resorrt life. Genoa is now a popular port for yatching and Mediterranean cruising. Amy Finley has written an excellent guide Italian Riviera Adventure Guide: San Remo, Portofino & Genoa. You can preview it, download it or buy a hard copy from GuideGecko. Use this hotel comparison service to find Hotels in Genoa. you will be given a choice of hotels and other accommodation as well as the choice of booking services, thus enabling you to find the best option. De Long Wine Info have built a solid reputation for making attractive wine information products.